Last year I didn’t grow any veg. I just couldn’t fit it all in. This year I decided I would make time, but I would limit myself just to a few types of my favourite vegetables. I bought a few packets of seeds, but somehow time passed, and before I knew it, we were into May with nothing planted. One of my friends mentioned that a local garden centre had vegetable plants. I know this isn’t the most frugal way to do it, but if I was going to grow anything, then this was going to be my only chance. I bought six different tomato plants, including some yellow and orange varieties. When I last went to France, I remember walking into the equivalent of our mini supermarkets and being met by a fabulous display of tomatoes of all different sizes and colours. I’ve not seen anything similar here: the choice seems to be large red or mini red. I also picked up some purple sprouting brocoli, a couple of courgettes, cucumbers and some leeks. 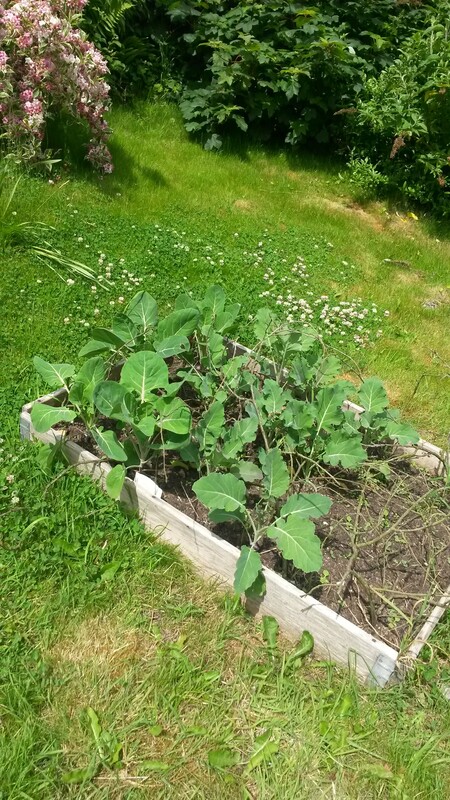 A couple of days later I went round to a friend’s house and in exchange for a donation to the Nepal earthquake fund, I obtained some brussel sprouts plants. Then a friend offered me some spare runner beans, tomatoes and a courgette. In no time at all, I suddenly had all my veg. 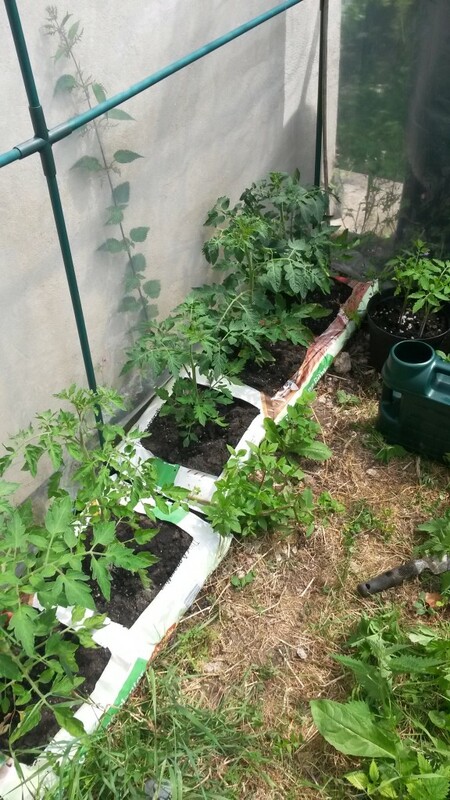 Here are the tomato plants, which are now growing vigorously. And here are the sprouts and psb which have really got going. The other thing which I have been please to see in the last few weeks are our plum trees which are beginning to sprout again. You might remember that it snowed heavily on boxing day and a number of branches snapped off. 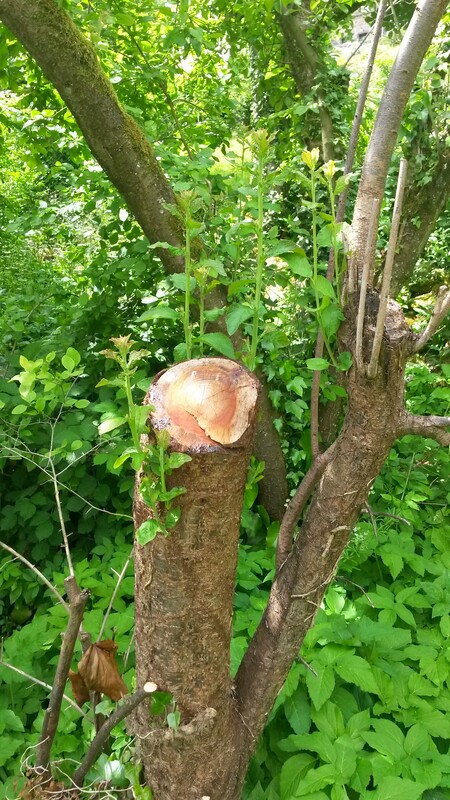 We weren’t sure if the trees would survive, but it now looks as if they are going to be ok.
How is your veg growing? I think I have discovered a way of cat proofing our beds for the first time this year – I’ve stuck loads of twigs in among the veggies. It doesn’t look pretty, but so far is keep the neighbourhood cats out!